An intuitive medical device for multiple applications is being developed at Culham Innovation Centre and is poised to enter the billion-dollar biopsy market. The device promises to improve accuracy, reduce time and limit patient stress during needle-based procedures. 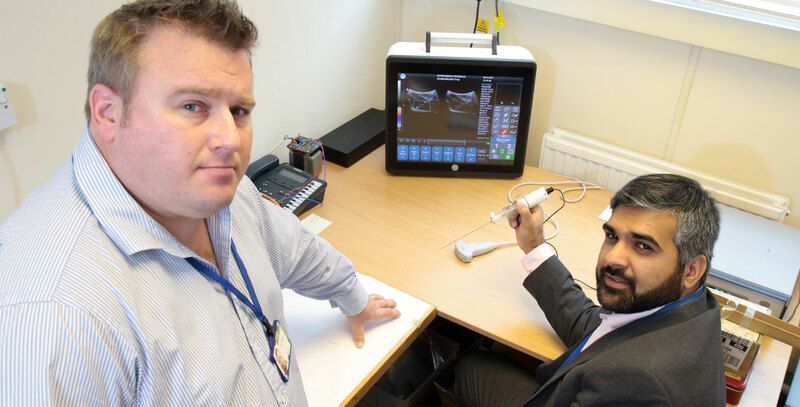 ActiveNeedle Technology is in the process of commercialising its needle-actuating device, which aims to reduce needle placement errors in ultrasound guided procedures and has recently taken more office space at Culham Innovation Centre to support ambitious expansion plans. This week, ActiveNeedle Technology has been named as one of the most exciting technology companies in the UK and an innovator to watch in 2018 by industry peers via TechRadar.com. A well timed accolade as the company is about to go through its second round of funding and is inviting Oxfordshire investors and potential partners to join the team as it scales-up to launch its problem solving product in the UK next year. ActiveNeedle Technology recently attended an event at The Terrace Pavilion in the Palace of Westminster to receive the Commended Innovation Award presented by Prof. Dame Julia Higgins, President of the Institute of Physics in the presence of Alok Sharma MP. Over the next five years, the company will expand geographically, branching out to Europe, the Far East and US with plans to open a US office in 2019. A further 6 – 8 people will be recruited over the next year, with an additional 10 – 14 people hired by the end of 2020. Culham Innovation Centre is part of the supportive environment at Culham Science Centre and is managed by Oxford Innovation, the leading operator of business and innovation centres with 24 located across the UK. Together with a combination of laboratory and office space, Culham Innovation Centre is in a prime location to help science and technology start-ups progress to the next level. Part of Oxfordshire’s Science Vale and based at Culham Science Centre, Culham Innovation Centre has over 10,000 sq. ft. of flexible office, laboratory, workshop and meeting room space. With offices available for 1 to 15 people, Culham Innovation Centre has the supportive solution to suit growing science and technology businesses. For further information on ActiveNeedle Technology, visit: activeneedle.com or to find out more about Culham Innovation Centre, visit: culham-ic.co.uk. Culham Innovation Centre is located on Culham Science Centre and offers over 10,000 sq. ft. of office space, with suites ranging from 100 sq. ft. to a more extensive area comprising 1,334 sq. ft., with flexible licence agreements available for temporary and long-term agreements. An Innovation Centre differs from a standard business centre by offering a raft of practical support that proactively encourages the development of start-ups, entrepreneurial and high-growth companies. Oxford Innovation is a leading operator of business and innovation centres that provide office and laboratory space to companies throughout the UK. Culham Innovation Centre is one of seven local centres managed by Oxford Innovation in Oxfordshire. The company also provides innovation services to entrepreneurs, including business-planning advice, fund raising, coaching and mentoring.